From version 2.1 onward, HomeWave allows you to remotely manage your lock’s PIN codes and schedules. If you upgraded from a previous version of HomeWave and you already have locks in your setup, then please re-link the lock controls to their corresponding locks to enable this feature! By long-pressing the lock control. To allow this, you need to enable Long press for PIN management in the lock’s Properties. It is highly recommended that you protect HomeWave with a PIN or Touch ID if you use locks. If you enable opening PIN management with a long-press, protect the individual lock control by setting it to PIN-protected as well. The PIN management screen contains a line item for each PIN. To edit existing PINs, swipe left on the PIN or tap the red circle next to it. 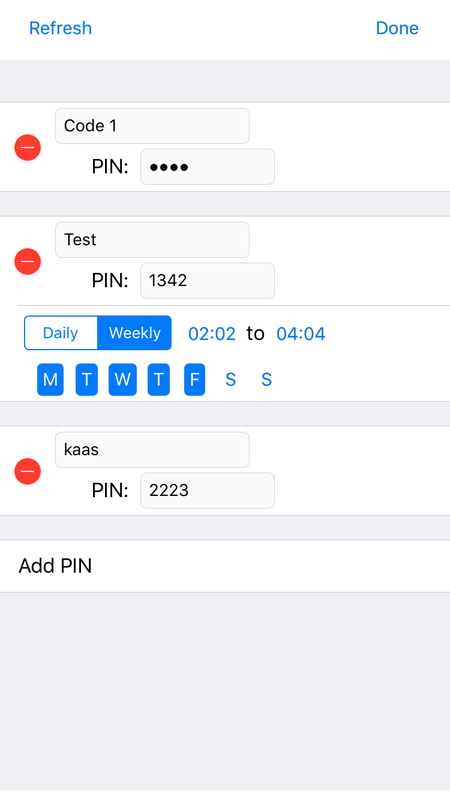 When editing a PIN, you can add schedules that determine when the PIN is valid; between certain dates, or on certain days and times of the week. Keep in mind that when you save a modified PIN, Vera will atempt to store the new PIN in the lock right away, but this may take time. Until the PIN is stored in the lock, HomeWave’s PIN management screen will not reflect your changes when you refresh the screen. Also keep in mind that you cannot edit encrypted PINs (shown as dots instead of numbers) without setting a new PIN code as well. This is a limitation of how PIN management works in Vera.